Cornish born clarinettist Jacob Perry began playing the clarinet at the age of eight. Through the Cornwall Music Service Trust, Jacob quickly began to show promise on the instrument and began to rise through the ranks of the Youth Orchestra system. 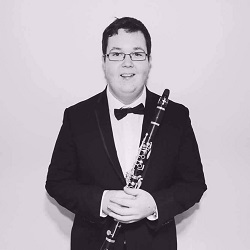 At 14 Jacob began studying with the freelance clarinettist David White, under whose tutelage he joined the South West Music School. At the age of 16 Jacob achieved his Grade 8 with Distinction, and went on to receive full marks in all of his GCSE and A level performances, as well as the award for the most outstanding instrumentalist at the Cornwall Music Festival. Jacob joined Birmingham Conservatoire in 2012, where he entered his final year of study in 2018 with Sally Harrop and Anna Hashimoto. Since coming to the Conservatoire, Jacob has performed with most of the ensembles, including performances in Birmingham’s Symphony Hall and at the Bozar concert hall in Belgium. As well as performing as a soloist, Jacob enjoys performing regularly with his Wind Quintet ‘Lumos’ (find them on Facebook for more information), and frequently performs with the Cornish Sinfonia, Birmingham Philharmonic Orchestra and the Piccadilly Symphony Orchestra in Manchester, with whom he performed at the International Conductors Festival in Danville. Jacob is proudly supported by the Lord Lieutenants Fund for Youth, the Radford Trust, the Maddocks/Mills Fund, BSM Centenary Fund, the Wolfson Instrument Fund and EMI Music Sound Foundation, who have made generous contributions towards the cost of instruments. Jacob played Mozart’s Clarinet Concerto in A Major, K.622 with the Sinfonia in May 2017.